The Dewoitine D.500 series were not the first all-metal low-wing monoplanes to see operational service with a major air force; that honor went to the Junkers D.I in 1918. They were, however, the first all-metal low wing flush-riveted monococque construction monoplanes to see wide-spread service with a major air force, and as such they were the harbinger of the "nouvelle vague" of fighter aircraft design that would dominate the skies of the world over the next 13 years. At the time the first prototype flew in 1932, Emil Dewoitine's beautiful design was the most advanced fighter in the world, faster and more maneuverable than anything else in the sky. Yet, by the time the aircraft entered squadron service in 1935, it was already eclipsed by the prototypes of the next generation of monoplanes, the Messerschmitt Bf-109 and the Hawker Hurricane. Had the European states gone to war over the Czech crisis of 1938, the D.500/501/510 series would have flown circles around the Luftwaffe's He-51 and Ar-68 biplanes; a year later the airplane was fortunate to have left front-line service. Such was the pace of aeronautical development in the 1930s. The D.501 was developed from the basic D.500, and differed in that it was the first fighter to be armed with a 20mm "motor-cannon", firing through the airscrew hub. Approximately one-third of the D.500 series ordered for the Armee de l'Air and the Aviation Maritime would be the D.501, which was produced alongside its more lightly-armed twin. The D.501 was exported to Lithuania in 1937, where a squadron of the type formed the most advanced squadron of the Lithuanian Air Force prior to the Soviet occupation of 1940. In France, some aircraft saw service during the German attack as factory defense flights, though in the main it had been relegated to advanced training status by then. This is the fourth release from Hi-Tech, a limited-run modelmaker in France . I am aware only of the preceding P-63 Kingcobra and the Breguet 14 (the missing kit may be the D.510); I was personally disappointed by the P-63 kit, and have heard that the Breguet becomes a good-looking model only after a lot of work and effort. The kit comes on three dark-grey sprues with 19 parts, a bag of 8 resin parts that include the main gear spats, cockpit floor, rudder, and underwing machine gun gondolas, a vacuformed seat, and two frets of photo-etch steel for the instrument panel and other cockpit details. 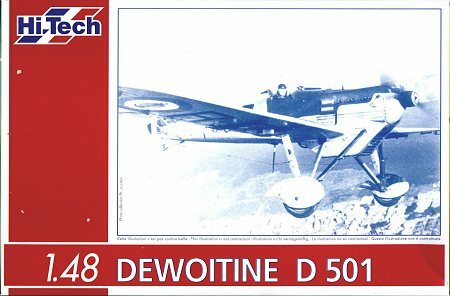 The decal sheet includes markings for one airplane, a D.501 of 2eme Escadre, GC 1/8 (ex. 3C3 Aeronavale) as seen in 1938 during the Munich crisis. The plastic parts appear to have better fit than did those of the P-63 (it would have been hard to be worse), and the moldings are clean for limited-run kits, though the engraved surface detail is a bit heavy, and will likely remain such under a coat of paint, since the airplane was in natural metal finish. The decals are deficient in that the red and blue stripes of the rudder insignia are not included; the center blue section of the national cockade is also missing and is to be provided by the modeler. While the kit provides a vacuformed seat which looks to create problems in getting the shape right, there is no vacuformed windscreen. Additionally, while a quite nice photo-etch instrument panel is provided, there is no instrument dial backing. Quite frankly, none of the missing items are something hard to create; every other limited-run kit made by every other limited-run kitmaker provides these items, and I personally do not see why a kit this contemporary in production and relatively expensive in cost is so primitive in what is provided. I will give Hi-Tech the benefit of the doubt by the fact that they are more of an enthusiast's company, and may not have the resources of an Eduard or an MPM. Be all that as it may, this is likely the only Dewoitine D.501 anyone will ever see in injection-molded plastic. It looks to be a good model for someone experienced in more mainstream injection-molded kits to "cut their teeth on" in successfully creating a model from a limited-run kit, and does not appear to present any great modeling difficulties (no rigging wires, etc.). There are aftermarket sheets that provide better national insignia, and the rudder stripes are not that hard to create. 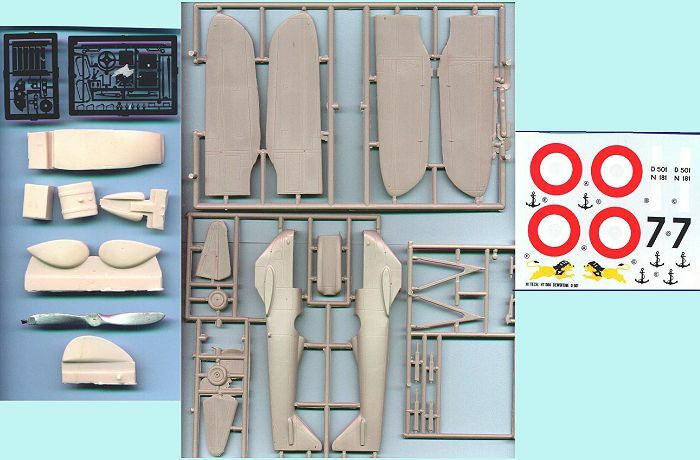 For the modeler interested in aircraft from the 1930s Golden Age, this is a good model of a very important (and good-looking) airplane from that era, and it will look good sitting next to the Battle-Axe Morane Saulnier M.S.225C-1, and the Classic Resin Airframes Loire 46. Modeling Madness thanks Squadron Mail Order (http://www.squadron.com) for providing the review copy.